My favorite part about working on a software project with real-world users is the feedback I get. It’s often said by industry veterans that you don’t know what kind of app you’re building until your users actually get their hands on it, and the wisdom of this statement has proven itself to me over and over. 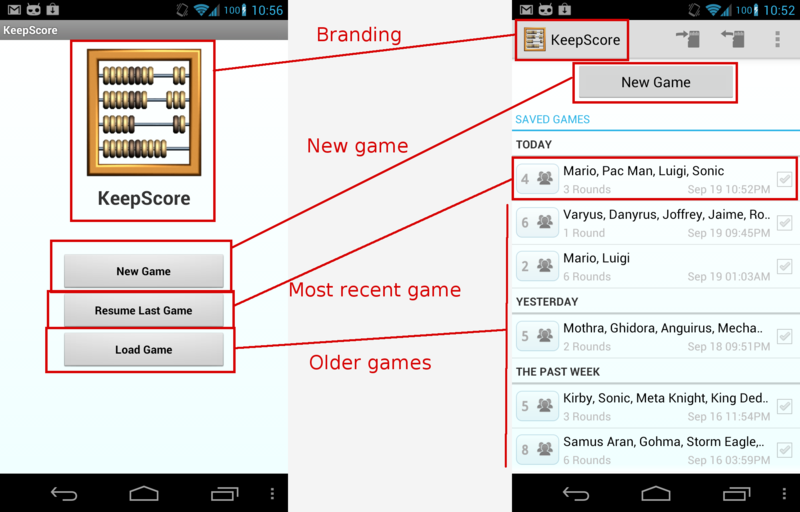 With KeepScore, the app itself is pretty simple – it just keeps score. And each time I write an update, I tell myself, “Welp, that’s about all it’ll ever need.” Then I get an email from an interested user with a cool new use case, and I just can’t help but code it up. So the app keeps growing and growing, but at each step I have to be extra-careful to keep the UI itself streamlined, simple, and dead-easy to use. With KeepScore version 1.2.2 (released today), I think I’ve managed to strike a good balance between functionality and usability. 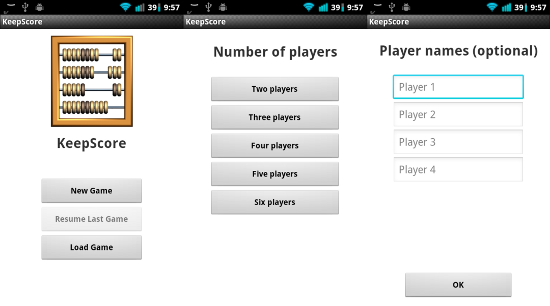 As many of you requested, you can now share your KeepScore games with a friend. 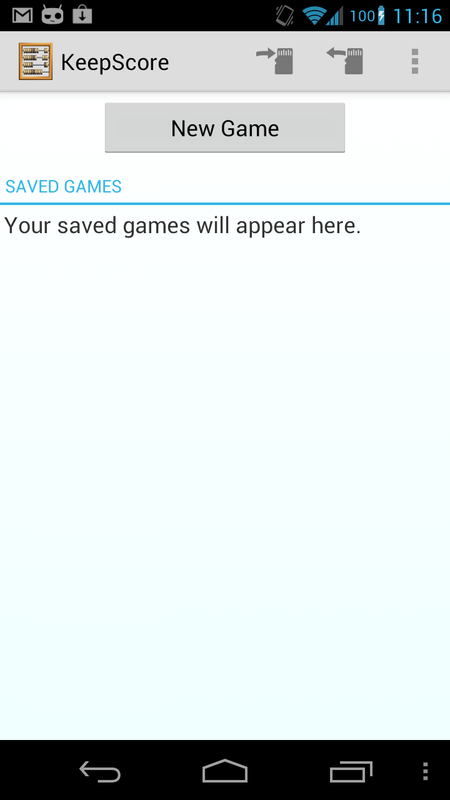 You can send a single game, specific games, or all your games. 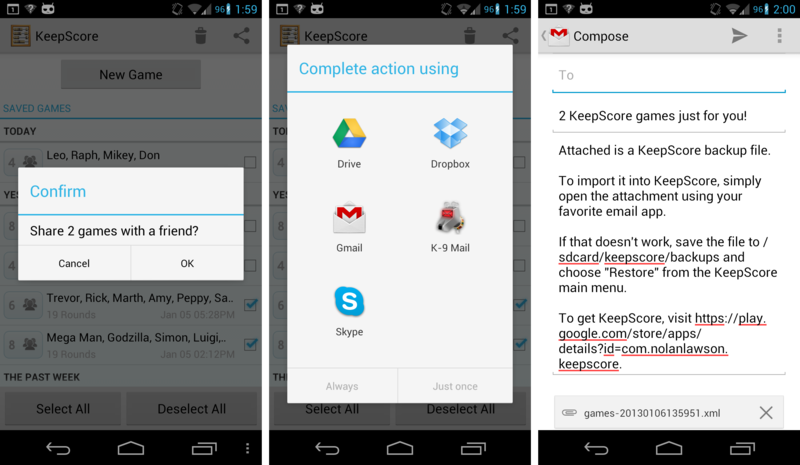 Just choose the games you want, hit the “Share” button up top, and KeepScore will create a special XML file that a friend can open with KeepScore on their own device. This feature also allows you to back up your saved games to Dropbox, Google Drive, or your favorite cloud storage service. Speaking of backups, there’s no more do-it-yourself! 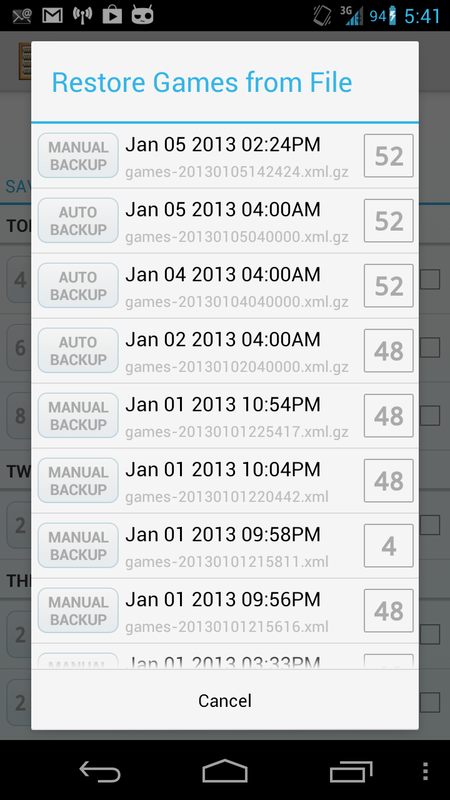 KeepScore automatically saves a backup whenever you start a new game. Look for them in the “Restore” popup. All your games are automatically backed up. These files are gzipped, so they take up a minimal amount of space on your external storage. As board gamers, we’re geeks. And as geeks, we love analyzing our board game habits in a number of different ways. Who wins the most games? Who’s scored the most points? What games do we play the most often? Rather than create a separate screen to answer each of these questions, KeepScore now offers an “Export Spreadsheet” feature. 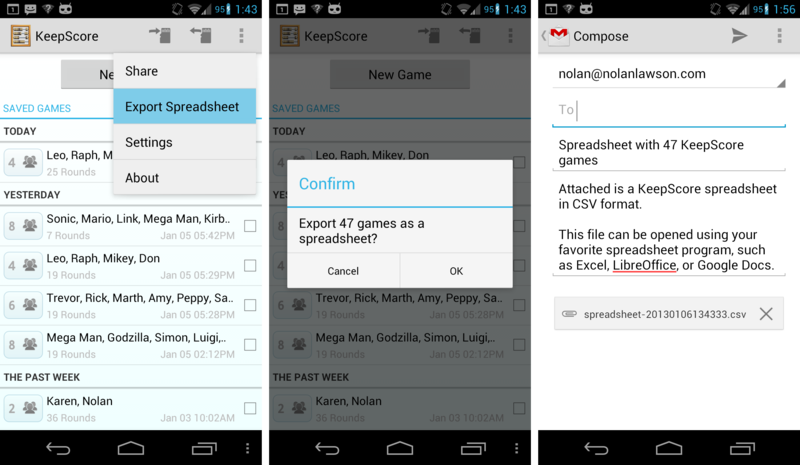 The spreadsheet may be imported into Excel, LibreOffice, Google Docs, or any document editor that accepts CSV files. Once you’ve opened up the spreadsheet, you can slice and dice the data to your geeky heart’s content. KeepScore 1.2.2 expands support for the Android “Holo” theme, which means it will look more beautiful and more consistent across different Android devices. Additionally, I’ve revamped the default “Light” theme to be more clean and minimalist. It’s inspired by the “card” interface from Google Now, which I adore. And if you’re scared by change, the old look is still available in the settings under Color Scheme -> Classic Light. A perennial complaint from users is that it’s hard to know if you’ve forgotten to add a player’s score. For round-based games (like Hearts) or games where the scoring order is important (like cribbage) this can be a real nuisance. KeepScore 1.2.2 solves this problem using a clever suggestion from my buddy Alex Lougheed: add a little bullet icon to show which player was updated last. 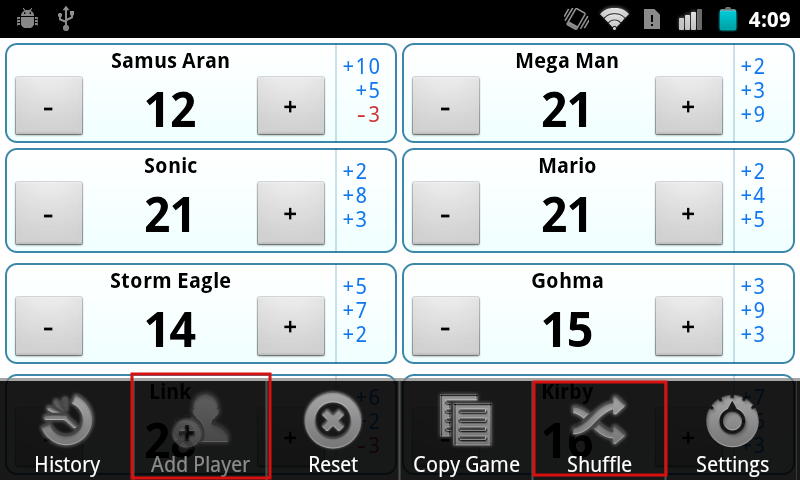 This means you can go player-by-player, totaling up the individual scores, without ever losing your place. The blue bullet indicates who was scored last. And if you’re playing a game where the player order doesn’t matter, you can disable the bullet in the settings. 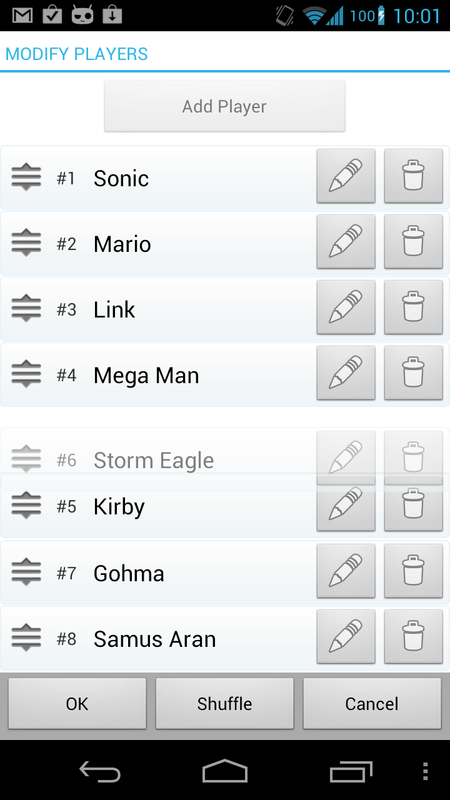 On many devices, the history chart doesn’t show up very well, because it either gets cut off or it’s too small to see. Rather than fiddle with the presets for every possible screen size, I’ve added some handy zoom in/zoom out buttons. Zoom in, out, and all around. Of course, pinch-to-zoom would be even nicer, but this works in a pinch (no pun intended!). 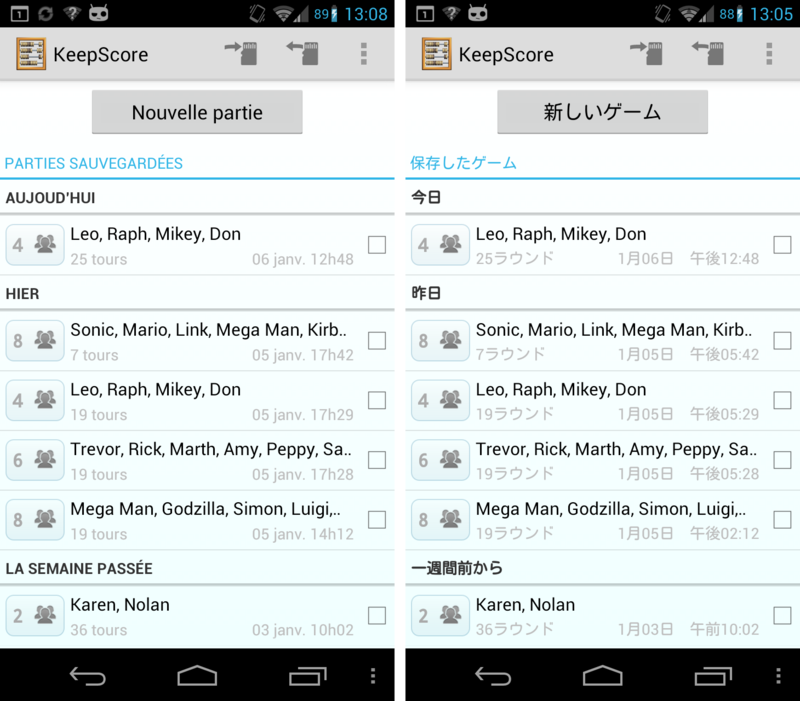 As always, KeepScore is localized into French and Japanese by yours truly. The German translation is out of date, though, and no other languages are currently supported. So if you speak German, Dutch, or Italian, and if you have some free time, please offer a translation! 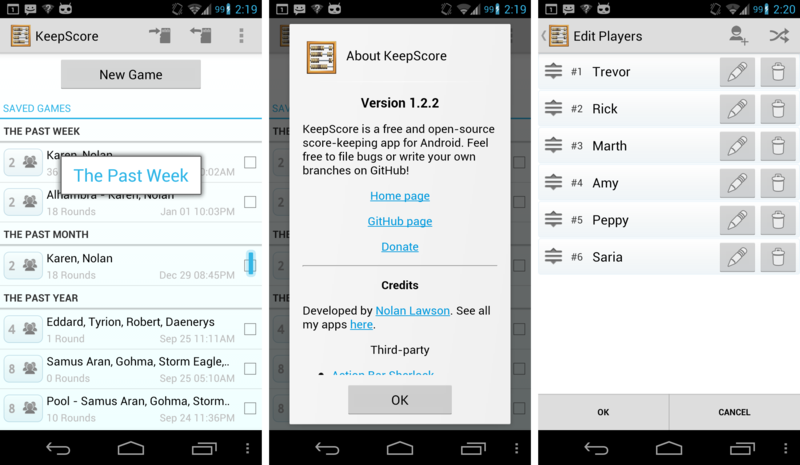 This isn’t really a new feature, but I’ve added a Donate version of KeepScore to the Google Play store for $2.99. Since I started work on this app, many people have asked where they could throw some change in my jar. But I resisted adding a Donate button, because after all, it’s just a counting app. Recently, though, I noticed that the number of code commits to the KeepScore repository has actually surpassed any other Android app I’ve written (even CatLog and Pokédroid!). 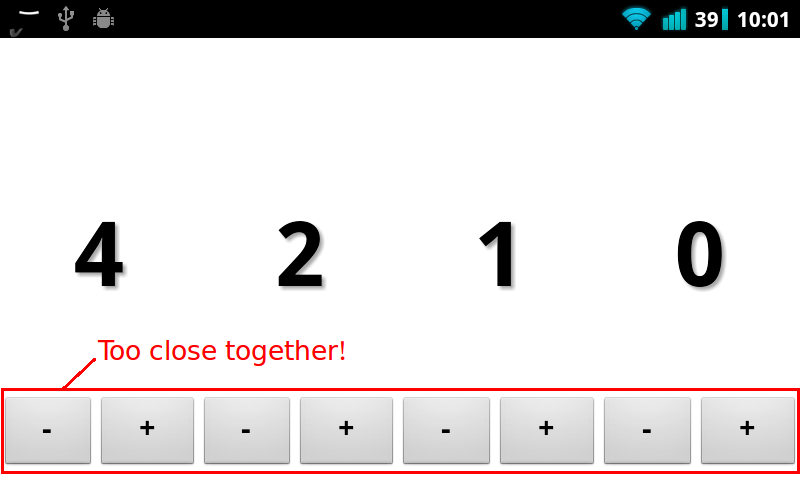 So I’ve had to admit to myself that this little counting app has morphed into quite the serious project. So if you’d like to support KeepScore, you can download the Donate version from the Google Play Store, or just donate via PayPal. Rest assured, though, that I will continue working on KeepScore regardless of your donations. For me, it’s just a fun app to write, and plus there’s still a lot of work to do. Next up: colors per player and battery-saving enhancements. This week at the pub I took KeepScore for its first test run in a little game of four-person cribbage. 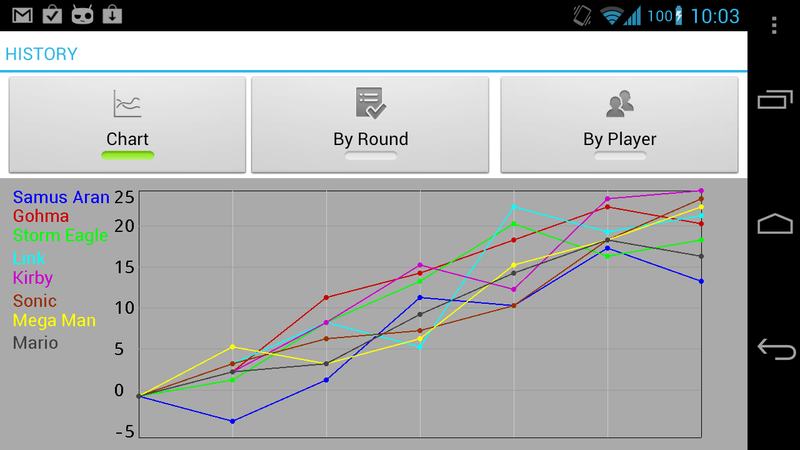 It got high marks from my friends, who agreed that KeepScore was better than the other Android scoring apps we had tried. (But of course my friends would say that.) Still, I also received some useful criticism that informed an update I wrote later in the week. It seems the biggest problem was that the bolded history items were too small, and therefore difficult to read. In light of this, I considered just upping the text size on all the history items, but then I realized: the only history item you’re usually interested in is the most recent one. When you’re trying to tap the button 7 times to add 7 points, you want to verify that you’ve actually added 7, instead of 6 or 8. But after you’ve given the player his/her points, you tend to stop paying attention until the next time you need to add points. So instead of the bold text, I decided to use little “badges” over the numbers (or “blibbets,” as we called them at my old company). I think they’re pretty neat looking, and they also make it dead simple to tell how many points you’ve added. 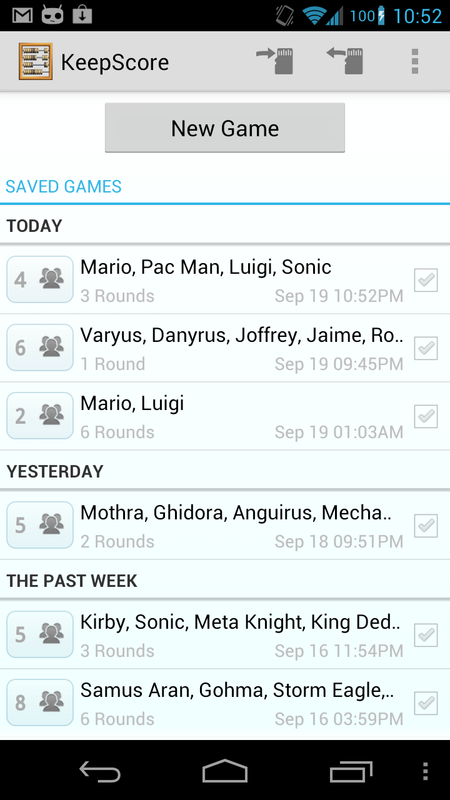 After 10 seconds of inactivity, the badges disappear and move over to the history column instead. This has the added benefit of drawing a clear distinction between the modifiable and unmodifiable parts of the history. Something else I noticed was that, in the long-press popup, the buttons were also too small and too hard to read. So I simply enlarged the text and gave the buttons more space relative to the EditText (which no one at the table used anyway). Both of these problems stemmed from the fact that I had only tested the app with the phone held in my hand, rather than flat on a table within reach of multiple people – which is how it’s actually used. Held in my hand, all the text on the screen is perfectly easy to read, but in the middle of a dimly-lit bar table, it’s another story. In the end, this turned out to be one of those slap-yourself-on-the-forehead-it’s-so-obvious kinds of problems that you can only really discover through usability testing. Last week I was in a pub having drinks with some friends when we decided to play a little cribbage. Crib is a great card game – it’s fun and fast-paced, it works well with anywhere between 2 and 4 players, and you can finish a round in about a half-hour. It’s pretty much the perfect card game. We didn’t have any pens or paper to keep score, though, so we turned to the Android Market to try to find a good scoring application. The first one we tried out, Score, crashed on us halfway through without saving our game. The second, Scorer, was workable but awkward. In the end, we were able to score our game, but it would have been much easier to just use pen and paper. Something about that struck me as wrong – this is the 21st century! Why can’t my damned smartphone keep score? I like thinking about user interface problems, so I followed this rabbit hole all the way to the end. I tested the most popular scoring apps on the Android Market, found them all to be underwhelming, and then finally wrote my own. My app, KeepScore, only took one weekend to write, but I think it’s already better and more usable than every other scoring app on the Market. What makes it better? My first advantage is simple hindsight. Since the other apps came out first, I was able to test them and see which design decisions worked and which ones didn’t. I remembered the frustrations that came with our impromptu game of cribbage: I pressed the wrong button! It didn’t save our scores! The screen fell asleep! Based on this experience, I knew what to avoid in KeepScore. Assume your users are illiterate. They won’t read anything. Assume your users have big, fat thumbs. They can’t press anything accurately. I won’t try to justify these principles here, because I think I already did a decent job in this post. 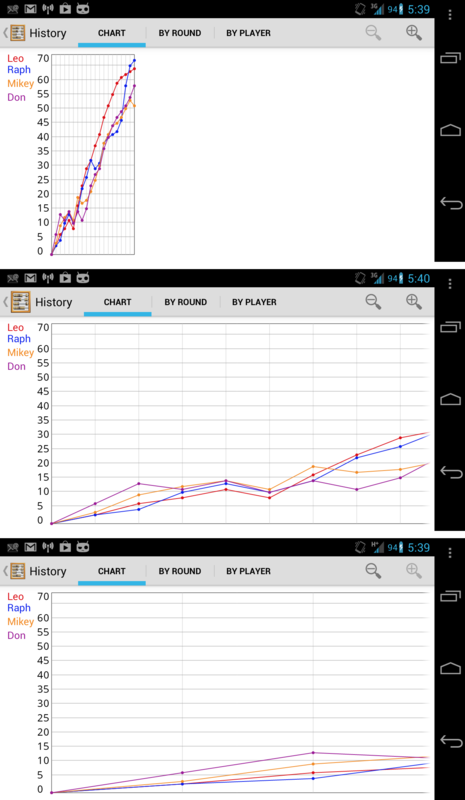 Instead, I’m just going to review each app in turn and show how KeepScore improves upon them. The screen doesn’t stay awake. In a game like cribbage, where you need to update someone’s score every 20-60 seconds, this is unacceptable. When we played, the game kept grinding to a halt every time the phone fell asleep. The game doesn’t save automatically. My friends aren’t used to my Nexus One, so they kept accidentally hitting the home key or the back key. Each time, we would have to enter all our scores again. The buttons are too close together. When your users are going to be juggling a handful of cards or game pieces while simultaneously trying to guide a finger towards the smartphone screen, there’s no reason to bunch up the buttons so close together. 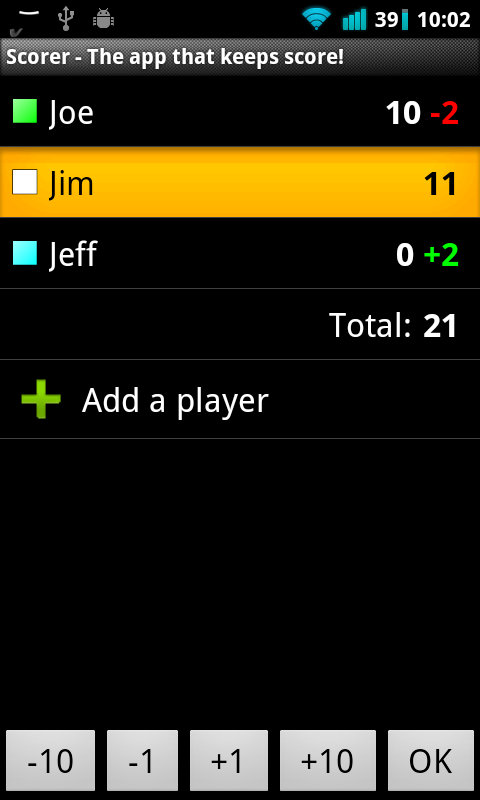 In Score, it’s easy to accidentally decrement one player’s tally when you meant to increment another’s. On top of this, Score just seems to suffer from sloppy execution. When you long-press on the “+” or “-” button, you get a popup allowing you to add a custom value, but it actually adds one less than whatever you enter. Many users have complained about this in the Android Market comments, but the dev doesn’t seem to have gotten the memo. Like Score, Scorer is a mix of good design and bad design. One feature I really like is the configurable buttons at the bottom – they make it easy to add large numbers to a player’s score (e.g. to add 12, press “+10” once and “+1” twice). Another highlight is the green and red increment markers next to each player’s name, which make it easy to see how much you’ve already added to someone’s score. 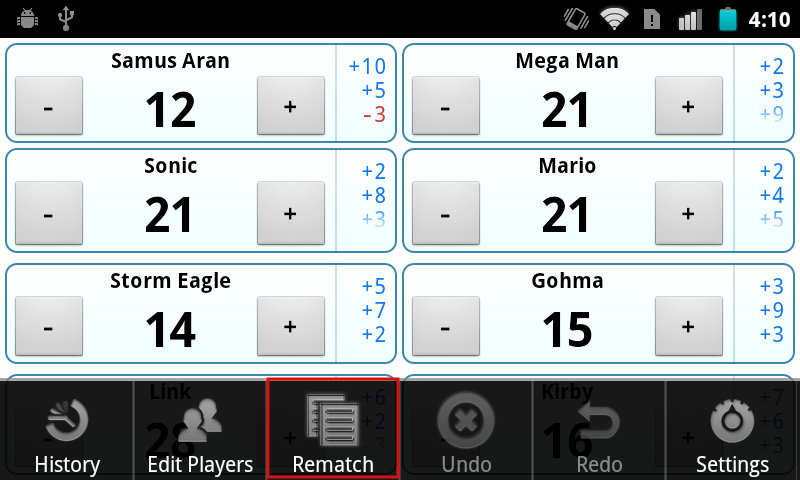 (I borrowed both ideas for KeepScore.) Scorer also keeps the screen awake and saves automatically, although unfortunately it can’t save more than one game at a time. Scorer’s biggest flaw, though, is just its basic layout design. 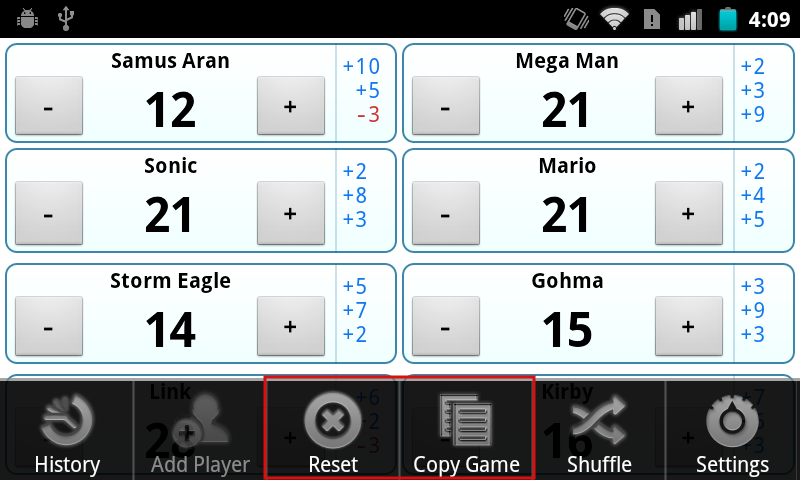 Rather than having separate buttons for each user, Scorer requires you to tap a player’s name before altering their score. This doesn’t sound like a big deal, but in practice it makes scoring very cumbersome. When playing cribbage, my friends and I would often accidentally add a score to the wrong player, and then we would have to figure out how much we added, backtrack, and add it to the correct player. Another problem is that the green/red markers only “commit” if you press the OK button. So if we wanted to make sure we could backtrack the correct amount, we’d have to keep pressing OK to add the score in. This meant at least three touches were required just to update a player’s score! Tap, tap, tap. It doesn’t sound like much, but it’s a minor inconvenience that adds up over the course of a game. I’m not even sure where to start with this one. This is a good example of the kind of graphic design I really hate: the developer has gone out of his way to deviate from the basic Android themes, and the result is an ugly and distracting presentation. On top of that, the app is very wordy and heavy on explanations. Touch the big button in the corner, and you’ll see a toast saying, “Please long click on this button to reset the counters.” Touch the back button and you’ll see “Press back again to exit the app.” Touch back twice and you’ll get a popup asking you to rate the app before you exit. Start up the app for the first time and you’ll get a popup asking you to download another app. And of course, there’s an ad banner over the top. The app seems determined to direct your attention toward everything except just keeping score. Other than that, the app is pretty basic. Press “+” to increment by one, and press “-” to decrement. There’s no way to add larger values at once, and if you long-press on the “+” or “-” buttons, you’ll get a long list of hardware buttons you can use in place of the on-screen button. I find this feature pretty useless, though, given that more and more Android devices are getting rid of keyboards, buttons, and trackballs. Also, if you press the “+” or “-” button rapidly, the current score won’t update at first – it’ll just sort of vibrate for awhile until finally updating at the end. I found that confusing. 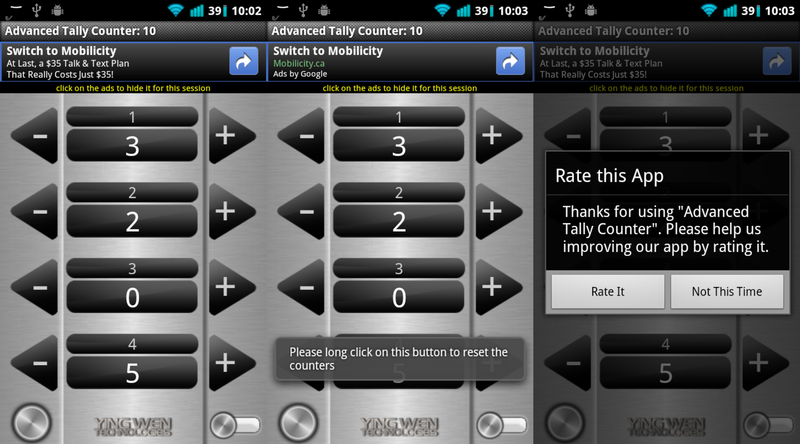 All in all, there’s no reason to use Advanced Tally Counter when there are less ugly and distracting alternatives. Also, the fact that the app has ad banners and a bewildering “Pro” version (I still can’t figure out what it does) reflects pretty poorly on the dev. Come on, dude. You’ve written a counting app. Are you really so hard-up that you need to try to make money off this thing? First off, let me compliment the graphic design here. This is a case where a developer has deviated from the standard Android themes, but unlike Advanced Tally Counter, I think the result is really pleasing to the eye. The motif is simple and unobtrusive, and the custom font lends itself well to the whole “pen and paper” theme. Even the stylized buttons are cute and not at all distracting. So I give the developer high marks for designing a really beautiful app. 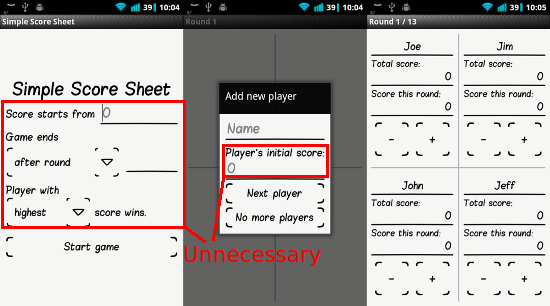 Unfortunately, the big problem with Simple Score Sheet is that it violates every principle of simple UI design. Whenever the developer had a choice between simplicity and complexity, he’s clearly chosen complexity. Just starting up a new game is like filling out a census form – it’s long, it’s tedious, and you have to think hard before you answer every question. Just look at the screenshots above. Everything above “Start game” on the first screen is totally unnecessary for 99% of the app’s users. What’s the starting score? Who cares – I probably just want it to be zero! The whole “Game ends after…” and “Player with highest/lowest score wins” questionnaire is also the height of arrogance. Why do I need to tell the app who’s won the game? Why are you forcing me to start thinking about how many rounds the game has? Before I’ve started using your app, I don’t even know how it keeps track of rounds! I just want to start tallying some scores, damn it! Even worse is the fact that the app will not let you complete the wizard unless you fill out all the information it deems necessary. If you try to press “Start game” without entering any information, it will complain: “Please enter a value for game ending option.” If you try to add a player without a name, it will complain again. All of these are pretentious moments where the developer is slapping the user on the wrist for not following his own complicated directions, like those old GPS navigation devices that would scold you for taking a detour. It makes the user think, and like the title of the famous book goes, Don’t Make Me Think! Once you finally make it past the bureaucracy and into the scoring app itself, the usual complaints apply. It doesn’t automatically save, it’s hard to tell how much you’ve already added to someone’s score, and it’s hard to add values larger than 1. In fact, its system for adding large values is particularly bad. The way it works is that, if you long-press on the “+” button, the counter will start to increase on its own, accelerating as you keep holding it down. This would be pretty convenient, except that it also gets set off if you tap multiple times in quick succession. In practice, this means that the score will often start zooming off like a runaway car, and then good luck trying to get the value back to what it was before. It’s a neat idea, but it’s just not executed very well. Enter KeepScore. 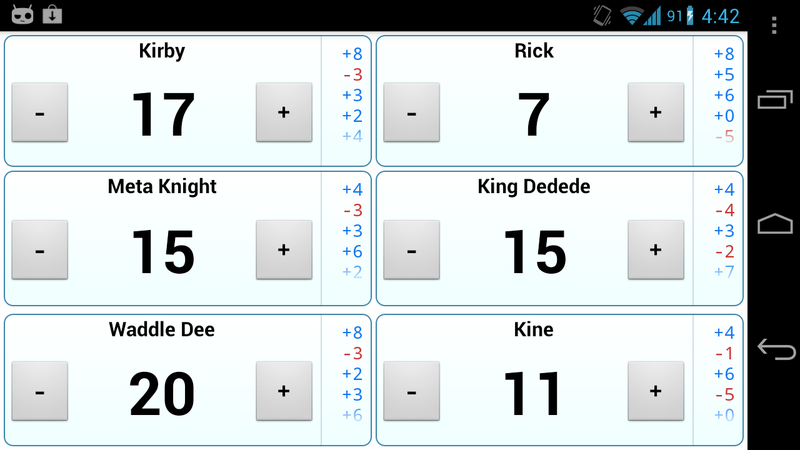 KeepScore, I believe, is the best scoring app on the Android Market mostly because it just tries to do what the name says: keep score. The UI is designed to be as simple and unobtrusive as possible, without any distractions or extraneous options. Let’s walk through it step-by-step. The startup screen and the “New Game” wizard are almost exactly the same as in Score. I added a “Resume Last Game” button, though, to provide a subtle hint that the game will be saved automatically. Other than that, it’s pretty basic, and when you open the app for the first time, it’s clear what you need to do: pound the “New Game” button. 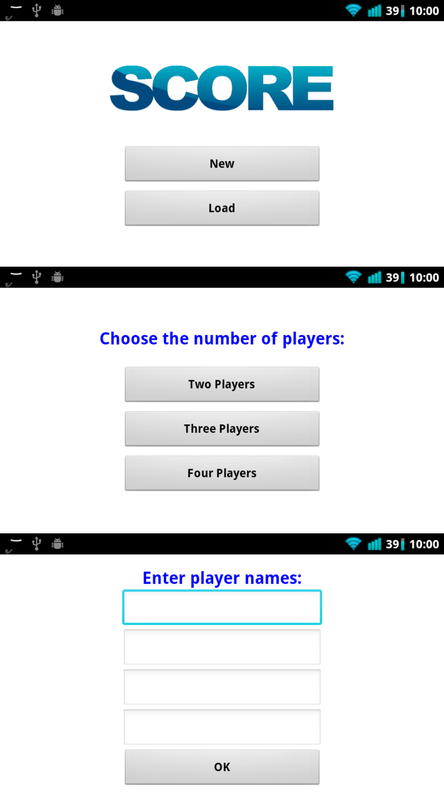 As you go through the “New Game” wizard, all information except for the number of players is optional. If no players are named, then the name simply displays as “Player 1,” “Player 2,” etc. (Contrast this with Score, where only blank text is shown.) 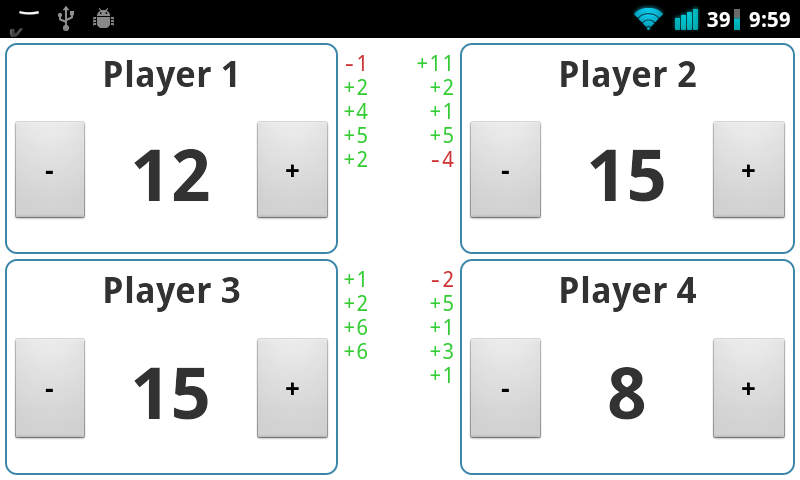 The scoring interface itself is very simple – two big buttons for each player, evenly spaced so that you’re not likely to accidentally press the wrong one. And of course, the app saves automatically. Whenever you exit, it displays a comforting toast saying “Game saved automatically,” just so the user can be sure that everything is good and saved. If you accidentally exit, you’ll notice upon reopening the app that the “Resume Last Game” button is no longer disabled. Most users will probably just make a beeline for that button, which is why I put it on the main screen. If you want to add values greater than 1, you can long-press on the “+” or “-” button. This pops up a dialog that allows you to input a number with the keyboard or just tap buttons with large increments like “+5” and “+10” (once again, configurable). It does worry me that this feature is “hidden” behind the long-press, but I think most users will figure it out if they know what they are looking for. Many of the other scoring apps let you long-press for additional options, so they might have set a precedent there. In any case, the app is still perfectly usable even without this feature. 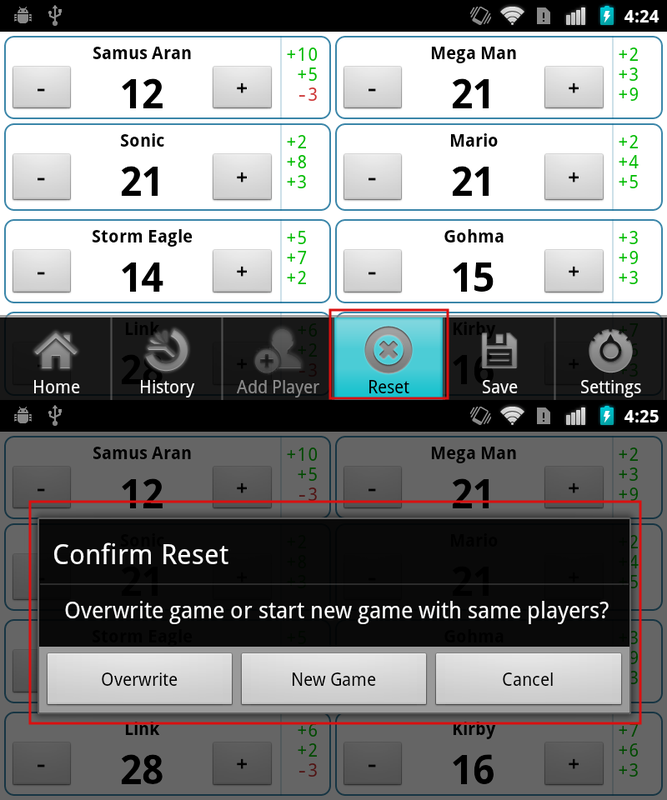 Unlike Simple Score Sheet, most of the configurations can be found in the Settings section rather than the main wizard, where it would just be clutter. There’s a concept in software engineering called “convention over configuration,” which basically means that the standard use-case should be the default, and the user should only need to use configurations if they want to do something unusual. I think KeepScore applies this principle pretty well, and that it makes for a smoother user experience. Any user actually looking for strange options (a starting score other than 0, customized button values, etc.) is probably savvy enough to know where to look for them. Other neat options include the ability to save more than one game, a separate screen to explore the game’s complete scoring history, and the ability to change a player’s name mid-game. Most users will not bother with these options, though, so I tried to keep them out of the way as much as I could. So there you have it. With just a little common sense and the restraint to not clutter up your app with unnecessary options and verbiage, you can create a dead-simple scoring app that actually beats pen and paper. It’s kind of sad that the Android Market went so long without an app that could do something so basic, but I’m just glad I finally have something worthy of my next cribbage game. And the best part: KeepScore is free and open-source. You can download it from the Android Market here or get the source code here.